Use Element properties panel to edit element’s attributes. For example, to edit classes of any element, or to change source and alt text attributes of an image. The panel also contains controls for properties defined by frameworks like Bootstrap. All changes done in the Properties panel are applied to all selected elements. Element properties panel has two parts. The top part shows general properties common to all elements. The bottom part shows specific element properties and contains controls defined by frameworks. Name, used to identify the element in Pinegrow (for example in the tree). pg-empty-placeholder class to elements that would otherwise be shown with height 0 and thus inaccesible in the visual editor. This class has no effect outside Pinegrow and is removed from the element once a child element is inserted into it. The Classes control lets you add and remove classes (for example .my-class) from elements on the page. In HTML, classes are listed in class element attribute. The control contains the list of classes that are assigned to the selected element and the Add class button. 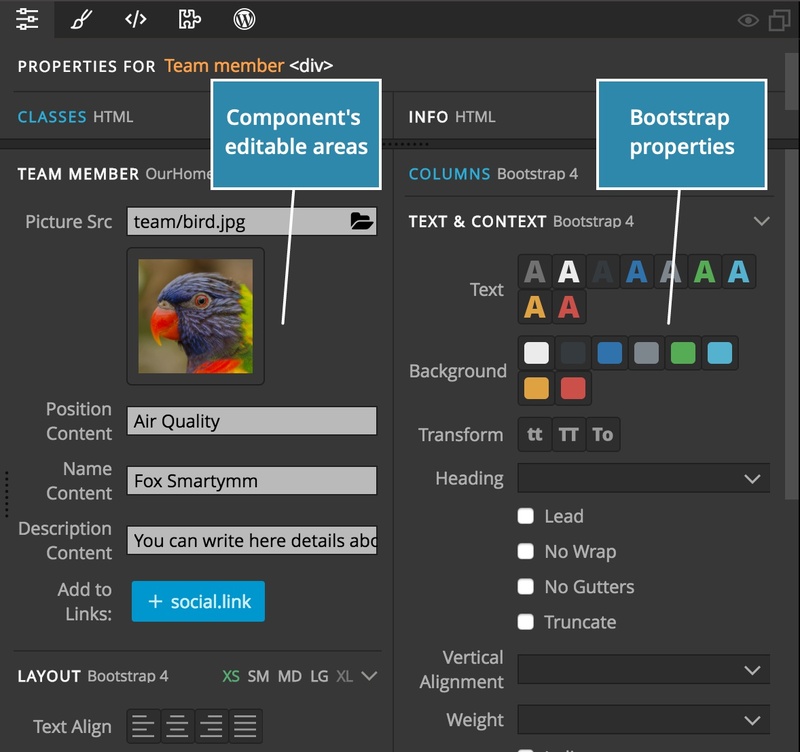 Classes section in Element properties panel. Remove the class by clicking on the x icon. 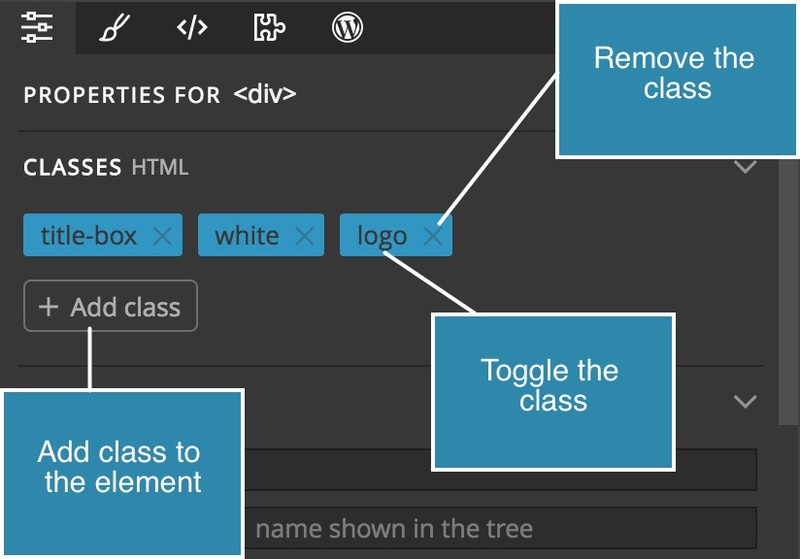 Toggle the class (switch it on and off on the element) by clicking on its name. Add a class to the element by clicking on the “Add class” button. 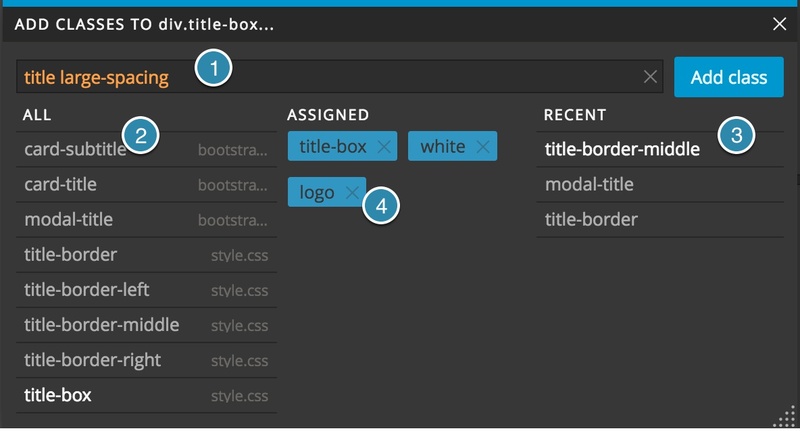 Add classes tool is a floating panel that lets you quickly add and remove classes from the selected elements. ENTER or click on Add button to assign the classes to selected elements. Use , or space to separate multiple class names. Shortcut Use CMD + L to open the Add classes tool. Shortcut right click on the element and select Add classes from the menu. You can give a name to important elements on the page, so that it will be easier to recognize the elements in the tree, in the undo history and elsewhere in Pinegrow. Use names to organise your projects. The name is stored in data-pg-name attribute of the element and it has no effect outside of Pinegrow. 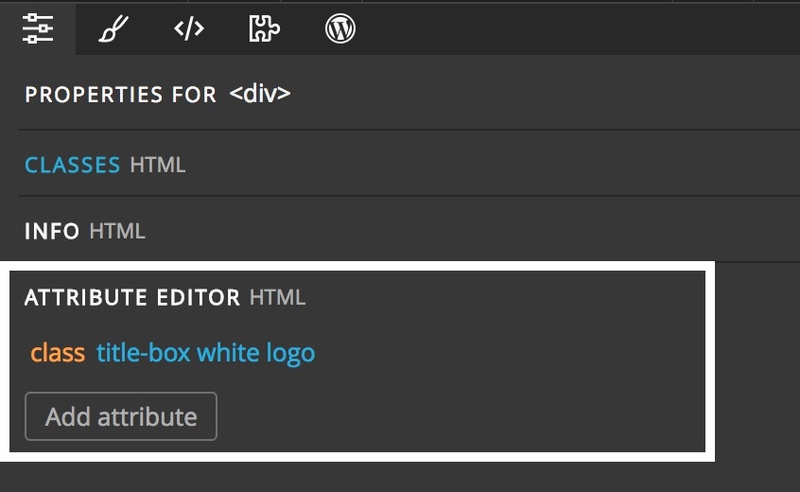 Attribute editor lets you edit HTML attributes (for example, title, src, class…) of the selected elements. Pinegrow has handy tools for editing most of these attributes (for example, Classes tool), but sometimes is needed to edit a non-standard attribute. data-* attributes are one such example. 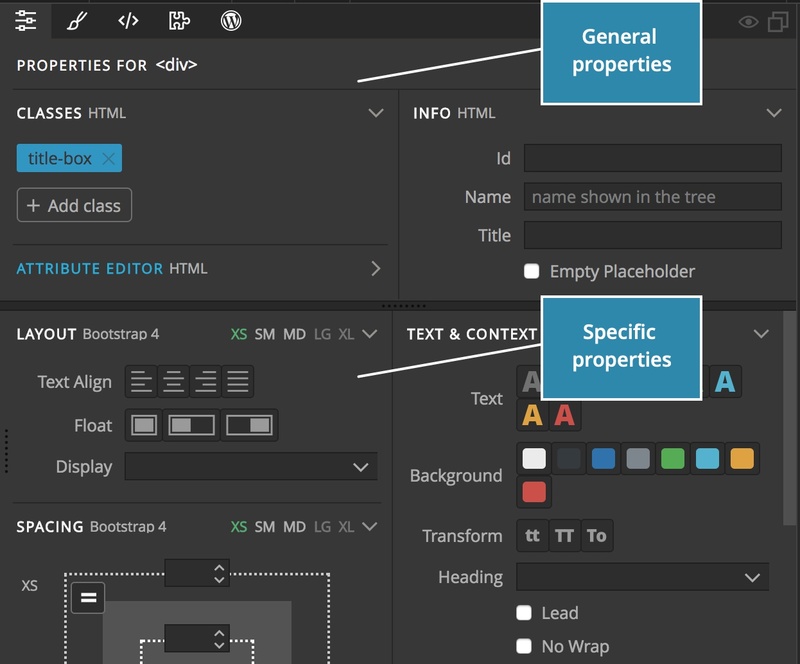 The bottom part of the Properties panel shows specific controls for the selected elements. Properties that depend on the type of the element.